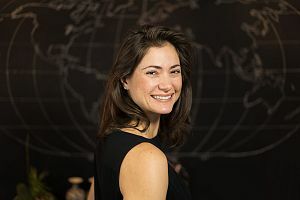 When my friend and wellness coach, Catherine Roscoe Barr, invited me to join her “The Life Delicious” Urban Wellness Retreat, I was intrigued and really wanted to join, but declined since the dates fell one week before my TEDxSFU Talk, an event I was extremely nervous about. At the time, I thought my best plan of action would be to keep my schedule clear to rehearse as much as possible for the speech. Hesitantly, I signed up feeling a bit scared I’d be losing valuable rehearsal time. By the time the retreat rolled around, however, I’d more-than-memorized my speech, as Catherine had predicted. The preparation I lacked was proper stress-relief and getting into the right mindset. The retreat took place. It was awesome. One week later, I’m at the Vancouver Playhouse about to go on-stage, and I’m feeling good. Surprisingly good. My breathing is calm. My heart isn’t pounding through my chest, like usual. My palms aren’t even sweaty. I had never felt more ready in my life to do something than typically terrifies me. Catherine had been right. The tools she offered and the information she shared helped me look at stress in a positive way. Catherine taught me to how use stress to my benefit. And I did. I am still amazed (and forever grateful) by the effect her curriculum had on my speech experience. Meditation, a key section within The Life Delicious curriculum, was also crucial in achieving my relaxed state-of-mind before the speech. I spent the good part of an hour deep breathing prior to stage time. Catherine’s philosophy of “abolishing the all-or-nothing mentality” really helped me get going with meditation. I started with one minute a day…because one is better than zero. Gradually I worked up to six minutes. My session before the speech was my longest yet and it felt great. Who Should Consider Attending The Life Delish Urban Wellness Retreat? feels they are missing something in life. isn’t satisfied with their career. wishes to find inner peace. struggles getting into a good workout routine. wishes to eat more healthfully. can’t seem to find time in the day to workout, meal plan and meditate. looks at stress in a negative light. Catherine’s wellness retreat is easy to commit to because just two hours of your Friday night are required (6-8:30pm). You have lots of time to head out for that TGIF glass of wine at 8:45pm. The Saturday and Sunday sessions are 9-4pm, so again, plenty of time to sleep-in, do a cozy breakfast at home, and then return home mid-afternoon to tackle a home project or veg out. How many others are in the retreat? Catherine keeps the group intimate — 20 people max. By the end of the session I can almost guarantee you will have made new friends. There are four healthy meals provided by SPUD / Be Fresh Local Market, which you’ll enjoy as a group. Coffee (49th Parallel) and tea flow throughout the day, too. Stretch Yoga in Chinatown (hidden above the Vancity Bank on Pender between Main and Columbia). This is another retreat perk — you get to discover Stretch, one of Vancouver’s independently owned gems of a space and yoga studio. Lots of them! Catherine’s work philosophy is to break the day up often and to reward yourself with fresh-air breaks, physical activity, water drinking and healthy snacking. She practices what she preaches. Between every section of her curriculum, retreat goers will have a chance to refill their water bottle, pee, mingle and move around. Besides a sweet goodie bag filled with gifts and discounts from Catherine’s favourite local businesses, you’ll receive a week-long pass to Stretch Yoga and a follow-up Skype session with Catherine to go over your goals and takeaways from the retreat. “Abolish the all or nothing philosophy,” is one of Catherine’s most important messages. We must break down the barriers that prevent us from engaging in healthy activities, like working out. She recommends getting sweaty — perhaps even naked — in your own living room with the help of body weight exercises. No clothes or equipment necessary. Easy! Ten minutes of running is better than none. One meditative breath is better than zero. And two seconds of yoga is better than no yoga. I couldn’t agree more. Catherine’s curriculum is divided into 10 sections, including chapters on stress, nutrition, sleep and working out. Throughout her casual, interactive lectures, she “sprinkles seeds” of information and inspiration — it’s up to us to listen, learn and nurture the seeds that resonate and start to grow. Another highlight of The Life Delish Urban Wellness Retreat is the inspiration quotes and messages Catherine shares from fellow thought leaders. She’s combed through endless amounts of content and curated the most meaningful, useful and inspiring information. At the end of the course, she provides guests with a list of resources, including her favourite books and TED Talks. This pamphlet alone is worth signing up for her weekend. Catherine is all about the feelings first mentality. She asks, “how do you want to feel?” Practice behaviours that will get you there. Thought-provoking, extremely personal anecdotes are sprinkled throughout Catherine’s teachings. She recounts a time in her life when, every day during work, she’d eat a large cinnamon bun and feel horrible afterwards. She didn’t connect the baked good with the crappy feeling until she began journaling and documenting her diet and successive feelings. Getting to know herself better through journaling has helped her get to a more fulfilled, peaceful place in her life. The Life Delish Urban Wellness Retreat isn’t a workshop you’ll have a “tough time” getting through. 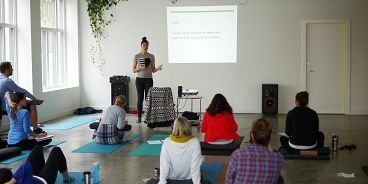 Minutes fly by with Catherine leading the upbeat, interactive lectures and conversation while participants sit comfortably on yoga mats with blankets. I made friends with the other guests, who were all interesting, intelligent people, all focused on improving their lives. Breaks are taken often (reflecting Catherine’s balanced work-day philosophy) and hydration is encouraged throughout the day. The group will engage in mini-workouts together — one of Catherine’s defining practices which she loves to do naked in her living room. She really does remove all barriers — in this case, the barrier being putting on work-out clothes. A twenty minutes run around Science World is another group activity. Breakfast, lunch and snacks are provided by SPUD (vegan options are available) and the group eats together. A goodie bag filled with coupons and freebies from awesome local companies is also given to retreat guests at the end of the weekend.